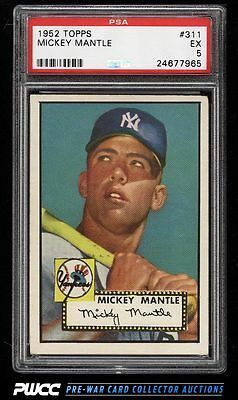 A glowing and altogether stunning '52 Topps Mantle for the grade. This card lights up the room, boasting unquestionably NM-MT surfaces and print throughout. By far the cleanest and brightest PSA 5 we've brokered in our history and certainly stands atop many of the other examples we've seen elsewhere, including some graded much higher. A bit of extra wear to the upper right corner is perhaps all the keeps this card to the conservative '5' level. All told this is a rock star for the grade; wonderfully preserved and a thoroughly pleasing throughout. Comes with our highest recommendation. One of nearly 17,000 cards, lots, and sets up for bid in our 8th Auction of 2016. Click on the link above to view the other PWCC auction lots.